I've found that some old guys who enjoy metal detecting will likely take on this search for you for a very small fee. Perhaps even just getting to keep what they find other than that knife. Sorry about your loss, sir. If you want to replace it, I recommend talking to Brad. If he doesn't have one and can't get one for you, he may be able to connect you with someone who can. Or, look at it as an opportunity to try something new. Lots of mid techs and customs available that can easily do anything a Strider did and you may find something you actually like better. After probably ten years of daily carry, sending her in for service a time or two, sharpening numerous times and an astronomical amount of use I lost my Strider PT yesterday. We were at the 1000 acre farm we lease and spent several hours cruising around and getting some work done. At one point some geese started going nuts on the creek and I caught a glimpse of a coyote so I grabbed my rifle and crouched down to try to get a shot. I was hopeful that this was where the knife came out of my pocket but a thorough search this morning yielded nothing. I am diminished. The best knife I've ever owned is gone and it is unlikely it can be replaced. I don't carry an expensive knife because i've convinced myself that carrying something (comparatively) cheap will prevent me from being upset if/when I lose it. This weekend I lost a $45 knife that I've carried for the last 5 years. I nearly panicked and only felt better when I was able to find it. I get weirdly attached to things, so I suppose I might as well take the plunge and get something nice. All that to say, sorry about your loss. If it's any consolation, blade technology keeps advancing. There's a lot of nice knives out there at a good price. Might be fun to go shopping and pick up something new. I forgot to update this thread, the Strider has been replaced. 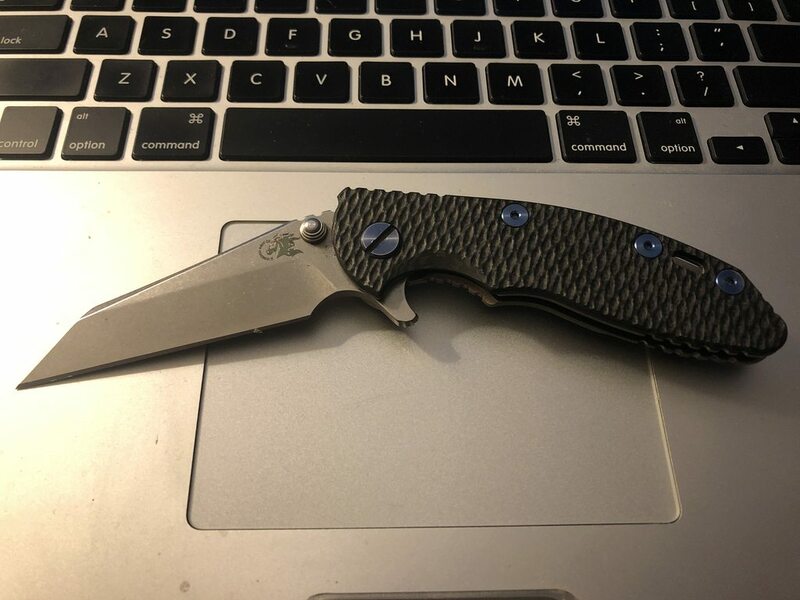 I got a good deal on a Hinderer XM-18 3" Warncliff flipper with a carbon scale and blue hardware. Lesson has been learned and I'll always miss my Strider so this one won't be carried while I'm enjoying my outdoor activities. A knife is no good if you're scared to carry it. Rent a metal detector. Go find that Strider. Take a rifle. You might kill a coyote. kinda like it!, looks like some good has come of loosing your strider.